Aircraft is Iraqi Airways Boeing 777-29M/LR, reg. YI-AQZ (cn 40993/1006). Aircraft is three years old, with original delivery taking place on 14DEC12. 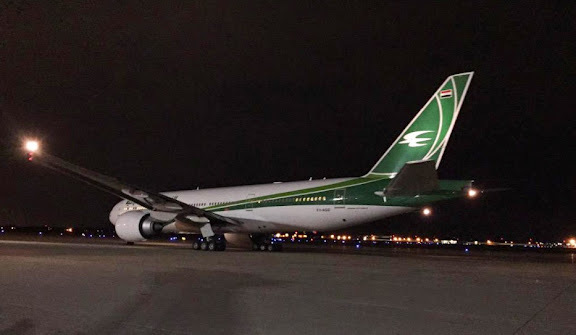 This is Iraq's most modern aircraft as well as the finest version of Boeing 777, exclusively used to carry Mr Abadi and his cabinet. It can reach destinations over 17,000km away. Who cares? Why is this important? Some Airab country's prime minister's airplane??!!! Aviation is a focus of this effort.